I remember when Nathaniel used to quietly sit in his bouncer and watch me cook dinner. 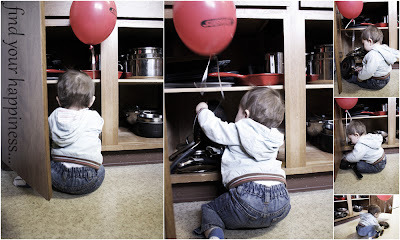 But now that he is mobile with his modified "crab-walk," he loves getting into everything especially my pots and pans. I used to wash everything he played with before putting them back in the cabinet but that quickly got old. It's quite a hassle having to pause the process of cooking and wash what I need before using it but whatever keeps Nathaniel happy and busy while I cook: I'll take it!